Latex bandolier is 52" long; attached pouch measures 10" x 10"
Everyone knows it’s not wise to upset a Wookiee. Well, almost everyone, but usually if someone does make that mistake they learn their lesson pretty quickly either with a stern roar in their face or by getting their arms ripped out of their sockets. 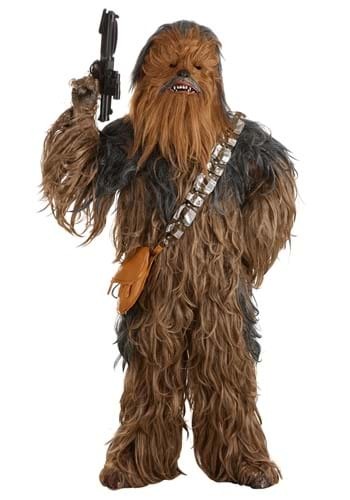 Nobody is going to even think about upsetting you when you are decked out in this Chewbacca Costume Authentic Replica. In fact, don’t be surprised if everyone forgets you aren’t really Chewie! This full body jumpsuit is covered head to toe in shaggy synthetic faux fur to resemble the scruffy style Wookiees are so fond of. Matching separate furry latex gloves and foot covers allow for better freedom of movement while seamlessly blending with the bodysuit, and the latex mask has eye and ventilation holes for comfort. Throw on the included bandolier and satchel accessory and you’ll be ready for your next smuggling run. Remember to keep your distance, but don’t look like you’re trying to keep your distance. Just fly casual!